Trawling through the numerous family-orientated social media groups, Crysta Darmanin says the main concerns on parents’ minds at the moment seem to be staying on top of their family’s busy autumn schedule and spicing up boring school lunches. Very often, sorting out the family schedule falls on the parent with stronger organisational skills. The dizzying array of extra-curricular activities, which our keeping-up-with-the-Joneses society insists on sending their children to, leaves parents juggling a mind-boggling assortment of schedules. Always striving to make the lives of parents living locally less of a chore, creating more time for adventure, here are our top tips for these two dilemmas which threaten to overwhelm us at the start of the scholastic year. An informal poll of my most organised friends has uncovered a multitude of ways in which carers can stay on top of their kids’ agenda. One super-organised mother of four hangs separate colour-coded files for each of her children off a magnetic notice board in the heart of the home. Yes, you guessed it – the kitchen. In it she puts a weekly timetable with all their school uniform schedules, school timetable for satchel packing the evening before and extra-curricular activities times and venues. Another nifty way of visualising the week ahead is investing in a magnetic perpetual calendar and colour coding each person’s schedule onto it for the current season. That way every person in the family has access to where the rest of the brood are at any given place or time. More hard copy options include a good-sized diary with lined sections in each day where you can record the special activities, such as school meetings and parents’ day, as well as regular activities. Some like to use a family planner, with a column for each member of the family, but personally I find that there is never enough room to write down all the necessary details in this kind of calendar. A hand pocket diary is indispensable to carry around in your handbag for jotting down notes on the go – just don’t forget to transfer the appointments to your master copy at home once you get back. Parents who use technology at the workplace tend to be more comfortable with digitalising their home lives. Both iOS and android have virtual calendar options you can share with your spouse and tweens, as well as sync with the online school schedules. The nifty option to set up reminders to alert you via your mobile goes a long way in avoiding clashes of schedule. The key to keeping control, as always, is effective communication – work out with your partner exactly how many hobbies you can afford to send each child to during that term. Remember to check regularly whether your children are still interested in continuing their training in that field before forking out your hard-earned cash on the annual fee and updated kit. It also pays to be crystal clear as to who will be driving the children to their respective activities ahead of time, leaving no room for ambiguity, so that no one gets stranded at football practice. When doing your research into new extra-curricular options, be practical enough to look in your area to avoid long traffic jams. For those of us still young enough to remember how boring it was to open up our school lunch and find the same old fruit plus sandwich combo day after day, our generation tries to put a little more effort into brightening up our little one’s school break. It helps that finding portable, healthy options has become much more mainstream. 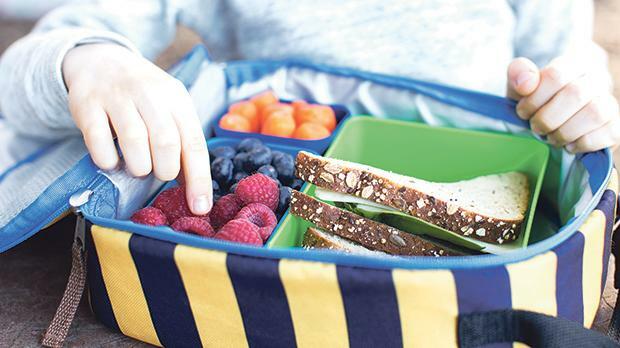 Invest in a solid lunchbox with different compartments – as it is very appealing to children having a variety of food spread in front of them at a glance. To this day I am still baffled as to why rice cakes are so appealing to my kids; no need to turn to the flavoured type; just go for the rectangular or mini ones which are more lunchbox-friendly. Try as I might, I just cannot get my kids to eat fresh fruit outside of the home, as they complain that apples get discoloured and peaches go mushy when left in the lunchbox. A practical solution are the reusable pouches that can be filled with any homemade puree of your choice, stuck in the fridge and whipped into the lunchbox in the morning. Although eating whole fruit is healthier as the fibre is lost during the smoothie process, vitamins remain intact and you can feel virtuous as you stay under the radar of the ever-stricter sugar policy in schools. Dried fruit is a winner. Little boxes of raisins are fun for sharing. Just keep them in a container in the kitchen cupboard unless you want the child to go through the embarrassment of offering an ant feast to their friends. Dried apricots also come in snack-sized plastic pouches and, apart from being soft and delicious, pack a mighty vitamin punch as the processing helps to preserve the impressive array of antioxidants and nutrients within. Bread sticks, cheese cubes, wholegrain cereals, wraps and mini yogurts all keep well as the temperature drops. Lastly, bear in mind that even if your kid is comfortable eating carrot sticks dipped in hummus at home, they may feel slightly inhibited to do so if front of their classmates. So take the stress out of adjusting to the autumn routine with these handy hints for staying on top of the bubble. Crysta Darmanin is editorials manager at the Malta Baby & Kids Directory, an annual publication distributed free to pregnant mothers registering at Mater Dei and Gozo General Hospital. The www.maltababyandkids.com portal is updated daily with family activities taking place around the Maltese Islands. Join the conversation on the maltababyandkids.com chat Facebook group and follow the maltababyandkids.com Facebook page to stay updated.